Minister of Natural Resources, Raphael Trotman meeting with the US Congressmen on Wednesday. 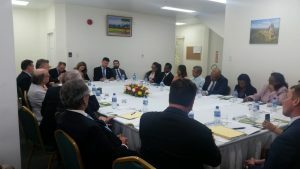 Guyana will not take over American companies, Minister of Natural Resources Raphael Trotman has told several United States (US) Congressmen who wrapped up a one-day visit here on Thursday. In clear reference to criticisms from some quarters about Guyana’s granting of a huge offshore concession to ExxonMobil and a Production Sharing Agreement with that American oil giant, Trotman on Wednesday told the US lawmakers that their American investments are safe. “American business and interests can rest assured that we will not nationalise their interests or take actions inimical to them,” he told the lawmakers and senior US military officers at his Duke Street, Kingston, Georgetown office. There have been calls for the agreement to be renegotiated to cater for more generous terms including a higher than US$18 million signature bonus that has been already paid. Back in the 1970s, the then socialist government led by Forbes Burnham had nationalised bauxite and sugar industries. But by the 1990s, with the end of the Cold War, Guyana had begun attracting international foreign investors in those industries and the telecommunications sector. In neighbouring Venezuela, the leftist government there has nationalised several foreign companies including ExxonMobil and ConnocoPhillips for which courts have awarded them billions of dollars in compensation. ExxonMobil, since 2015, has so far discovered more than 4 billion barrels of oil equivalent offshore Guyana. Trotman, who was trained in security issues by the US, stopped short of again stating that ExxonMobil’s presence in Guyana serves as a territorial buffer against Venezuela which claims the Essequibo Region. “This government has been criticised for this strategic relationship, but we will not recoil or resile from our position as we are mindful not just about the income of tomorrow, but equally also, about the long term security of the state,” said Trotman. The ExxonMobil offshore concession on the Stabroek Block stretches along the entire Essequibo Region and part of Demerara. He said government has “done everything humanly and legally possible to be as prepared as we can be” for the oil and gas sector. The Congressional members of the U.S. House Committee on the Judiciary , who are responsible for overseeing the administration of justice within the federal courts, administrative agencies and Federal law enforcement entities, also met with President David Granger accompanied by Foreign Affairs Minister Carl Greenidge and Minister of State Joseph Harmon. The Ministry of the Presidency on Thursday confirmed that hemispheric issues including Venezuela and Brazil were discussed during that fact-finding mission. While Minister Trotman recognised Guyana’s relationship with other countries, he said this country’s ties with the US is of a “high geo-strategic value” and the APNU+AFC coalition-led Granger administration “intends to preserve it”. “In our view however, that with the United States of America is most favoured and it is to be preserved,” he said. Trotman said Guyana welcomes American companies in Guyana’s extractive industries sector and ExxonMobil, as one such company, is seen as a strategic national development partner.”. The Natural Resources Minister said that the Congressional visit would “take our relations to a new level of engagement and mutual understanding, and also cement it for generations to come”. Trotman acknowledged the US government’s support and that of the World Bank to help “lay the foundation” for Guyana’s Extractive Industries Transparency Initiative. He further noted that the Energy Governance Capacity Initiative (EGCI), an initiative of the US Department of State, has produced for research papers and recommendations in the areas of Fiscal Policy and Accounting, establishing a Model Petroleum Contract, best features for a National Oil Company, and Economic Modelling and Analysis of Contracts to name a few for Guyana.